NEW ORLEANS (AP) — Bad memories came flooding back to Saints coach Sean Payton after a fifth straight regular season opener ended in defeat. It wasn't just that the Saints lost, but how it happened. An anemic pass rush and blown coverages helped an opposing quarterback look as spectacular as any point in his career as the Saints fell behind big. Prolific Saints QB Drew Brees orchestrated a frenetic rally to make it interesting, but ran out of time in a 48-40 loss. "That's the type of game we've played in years past as a .500 team," Payton said, alluding to three straight 7-9 seasons from 2014-16 before the Saints returned to the playoffs with 11 wins in 2017. "We had way too many mistakes." Ryan Fitzpatrick, a 35-year-old journeyman in his 14th season — and who was signed in 2017 as a backup to 2015 first overall draft pick Jameis Winston — finished with a career-best 417 yards. It was only the second time he'd surpassed 400 yards in his career. Two of his four touchdowns went for 50 or more yards. He had eight completions of 20 or more yards. He also ran for a short touchdown and scrambled 12 yards on third-and-11 for a game-sealing first down with about two minutes left. Afterward, Bucs coach Dirk Koetter gloated that "Fitzmagic" is "alive and well." Receiver Mike Evans, who caught seven passes for 147 yards, said he hoped some fantasy football players had Fitzpatrick in their lineup. 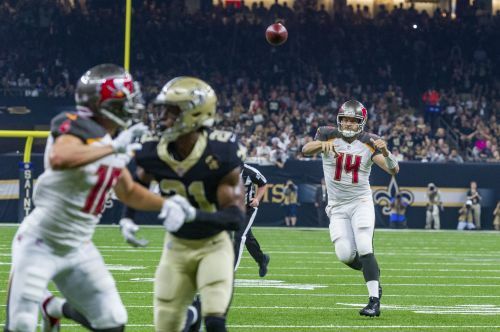 Suddenly, the Buccaneers are brimming with confidence and optimism that would not have been expected for a team that won five games in 2017 and entered Sunday as more than a touchdown underdog. "It's fun to be out there thinking you're going to score on every possession," Fitzpatrick said. "This is a different year. This is a different team." There have been four seasons since 2012 during which a quarterback going against the Saints was a recipe for a fantasy football bonanza. If that's the case again, New Orleans, which came within a play of advancing to last season's NFC title game, will struggle to realize the promise with which the current campaign began. Consider the convergence of these two occurrences: 88 combined points broke a record for an NFL regular season opener that had stood since 1947 (Eagles 45, Redskins 42) and both starting quarterbacks were 35 or older. Brees is 39 and the two QBs' combined years of NFL experience was 30 coming in. While Fitzpatrick had a career day, Brees was near vintage, finishing with 439 yards and three TDs without an interception. "Playing quarterback in this league is tough and it is a week-to-week proposition, with the highs and lows," Fitzpatrick said. "But that experience factor does go a long way out there." Tampa Bay's schedule doesn't get any easier. The Bucs host defending champion Philadelphia on Sunday. So they'll be hoping receiver DeSean Jackson recovers quickly from the concussion-like symptoms that knocked him out of the game against New Orleans in the fourth quarter. They'd also like to see cornerback Vernon Hargraves return quickly from a shoulder injury — never mind the fact cornerback Brent Grimes didn't play because of a sore groin. Jackson caught five passes for 146 yards, including touchdowns of 58 and 36 yards. His injury came as he was tackled along the sideline after a 35-yard catch. Hargreaves forced Saints running back Mike Gillislee's fumble, which safety Justin Evans returned for a 34-yard TD. Signs continue to point up for young Saints' offensive stars Alvin Kamara and Michael Thomas. Kamara picked up right where he left off last season, gashing opposing defenses as a receiver while finding ways into the end zone from the red zone as a runner. Kamara caught nine passes for 112 yards and a TD and also rushed for two TDs and a 2-point conversion. Thomas caught a Saints franchise single-game record 16 passes for 180 yards and a touchdown. But his performance was marred by a fumble across midfield that stalled a promising drive in the third quarter. Evans left the Superdome with no small measure of vindication. During his visit to the Superdome last season, he was so seemingly frustrated by Marshon Lattimore's blanket coverage that he decked Lattimore after the whistle, drawing a one-game suspension. His lasting memory from his most recent visit will be gliding into the end zone to complete a 50-yard touchdown reception while Lattimore sat on the ground after losing his footing. "I like my odds again anybody — not just him," Evans said.